by using J-OCTA and Digimat. By adding graphene sheets, the thermal conductivity of CFPRP material can be improved. However, when unmodified graphene sheets are added, they aggregate and then the thermal conductivity may not be improved as much as expected. 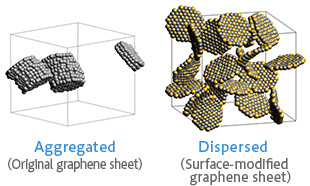 In this example, the objective of the simulation is for understanding the effect of the dispersed structure of graphene sheets to materials. The matrix is assumed to be PEEK. 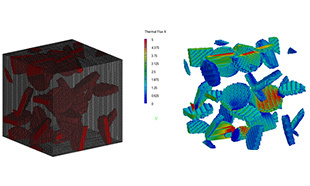 The simulation demonstrated that the difference of the filler dispersed structure in the matrix influences the thermal conductivity of the whole material. The thermal conductivity of CFRTP was successively improved by adding graphene sheets to the matrix. Furthermore, we can see that the graphene sheet whose surface is modified and dispersed uniformly can improve the thermal conductivity of CFRTP more effectively than the one unevenly dispersed, regardless of the amount of the added substances.